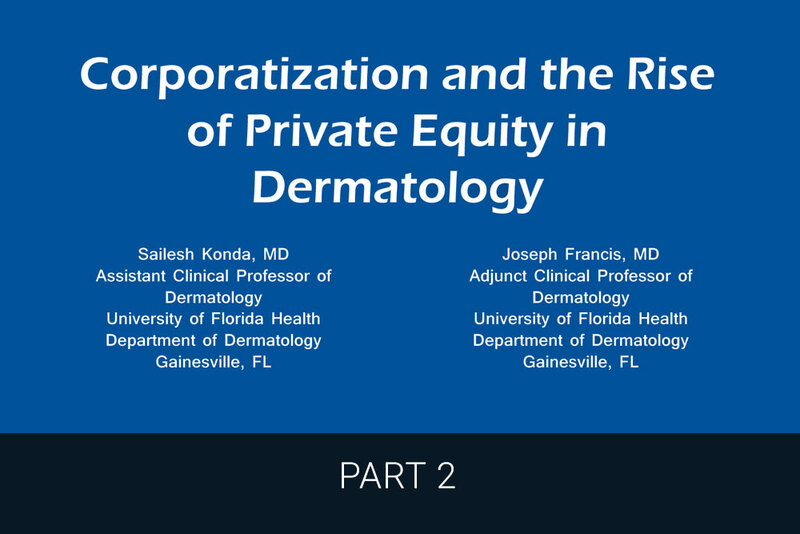 I am pleased to publish my second delivery in this 2-part series, offering our perspectives on private equity (PE) to residents and early career dermatologists reading Next Steps in Derm. In part 1 of my series, I provided an overview of the PE landscape in dermatology along with five out of ten concerns about PE-backed models. Herein, I will highlight the remaining 5 concerns about PE-backed models and offer my final thoughts on how to prevent PE-backed consolidation. 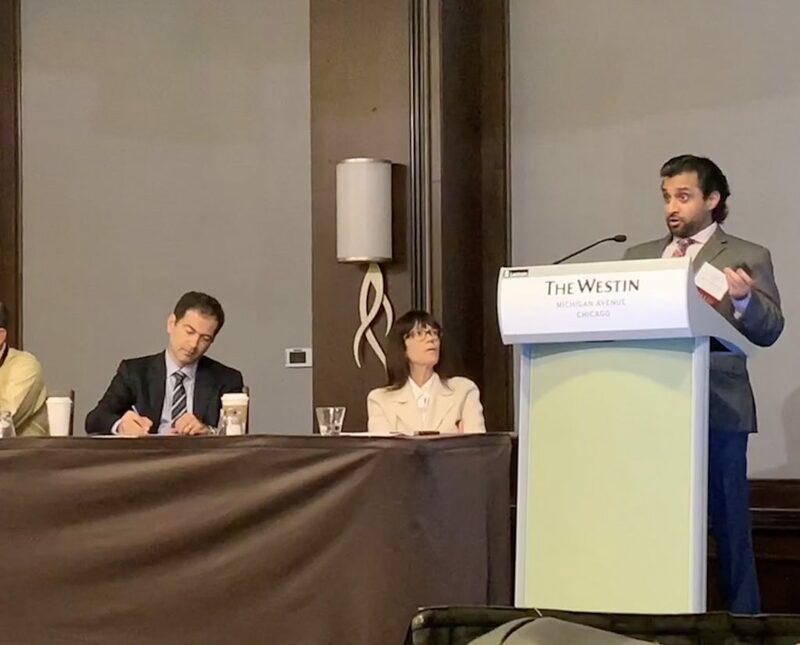 Sailesh Konda, MD, FAAD lecturing at the Association of Professors in Dermatology in Chicago, IL on October 6, 2018. I encourage you to read more about physician practice management groups, including PhyCor, Innovative Clinical Solutions (previously called PhyMatrix), and ProMedCo, which suffered financially and filed chapter 11 bankruptcies during the early 2000s. Additionally, two PE-backed dermatology groups, U.S. Dermatology Medical Management and DermOne Dermatology, are now defunct. Dermatopathology previously underwent consolidation with backing from PE. In 2014, the global fee for one of the most common CPT codes (CPT 88305) billed was cut by 33% followed by a 7% reduction in 2017. The market forced volume into corporate practices that could withstand the cuts. After the CMS cuts, Avista Capital Partners acquired Miraca Life Sciences in 2017 for 24.2% of its initial purchase price. Corporate dermatopathology is now redefining the value of a dermatopathologist. This is a game of musical chairs and you do not want to be the last one standing when the music stops. Once PE-backed dermatology groups corner certain markets, they will be able to redefine pay structures for board certified dermatologists. This has already happened with dermatopathology. 4. Who is the next owner after the flip? The end game of all PE firms in dermatology is to consolidate by acquiring practices, extract profits by growing revenue and taking out cost, and sidestep public regulations with an ultimate sale of their commodities (physicians, extenders, and offices) to another entity in 3-7 years. The next owner after the flip may be another PE firm, a larger healthcare conglomerate, the public via an initial public offering, or an insurance company. Late career dermatologists may benefit from selling their practices to PE-backed corporate dermatology groups, leaving early and mid-career dermatologists with primarily employed positions at these companies. This phenomenon as allowed the corporate structure to insert itself between the generations. However, we now have a way to reunite the generations with TBCD Career Center, which is the new paradigm for job openings. This Facebook group was started in May 2018 and has been growing exponentially with +1250 members including current residents and +140 PE free dermatology job postings. PE-backed dermatology job postings are flagged as PE-backed. You may hear other viewpoints from our colleagues, including influential leaders, in support of PE commoditization of dermatology and their desire to help residents and dermatologists navigate these new PE waters. When hearing these viewpoints, it is important to consider undisclosed conflicts of interest on a regional or national scale and understand who has skin in this game and truly stands to benefit financially from these pyramid schemes. Early to mid-career dermatologists are waking up and realizing PE is using them as pawns in a chess game and taking advantage of them. If you decide to join a currently independent group and do not want to be employed by a private-equity group in the future, consider asking for a “PE buyout clause” or “non-assignable clause,” which limits your employer’s ability to sell your contract to another entity. Remember! Only YOU can prevent PE-backed consolidation. We should be writing our own future rather than allowing outsiders to write it for us. We need to reunite the generations to preserve and pass on an autonomous and viable field to the next generation of dermatologists. The pendulum always swings back. My colleagues and I recently published an article in the Journal of the American Academy of Dermatology entitled “Future considerations for clinical dermatology in the setting of 21st century American policy reform: corporatization and the rise of private equity in dermatology.” I encourage you to read this publication, which was featured in the New York Times, to expand your knowledge about PE in dermatology.